Sister Josefa has to be one saint that has impressed me to follow Jesus more than any other, including saints in the Holy Bible. She suffered incredibly so for the love of God. Not many people can boast of descending into hell on a regular basis every week, thinking she is dammed forever and the Devil and all the demons believe it to be too, over and over again. God placed her there time after time to be a victim for souls, so that they may be saved from eternal fires. Not just for an hour at a time, often hours at a time. She is so powerful, every time I say this novena with a humble heart, I always feel the power of God’s presence at the beginning at the novena. It is a truly a powerful novena, because of her faithfulness to suffer for Jesus and for souls, on His terms. Once again to suffer isn’t what it is all about, we can suffer and suffer and not save our own soul, but if it is done in obedience to God and in union with His suffering it has great merit. This is how God finds out the sheep from the goats. Goats will run from suffering, they only want the good things in life. People might be confused why at the end of the novena we would offer up three prayers of Glory be’s, in honour of her. Some people would say straight out that is worshiping the saint, who is not canonised but I believe is more of a saint then many that are. Catholics do not consider that is worshiping at all but honouring her of her obedience to God. It might not seem obvious to a Protestant but we are in fact saying How Great Art God who can raise a lowly servant such as her and turn her into something so great that I envy her holiness to such a degree I want to follow Jesus as much as she did, if not to my very best for the Glory of God. 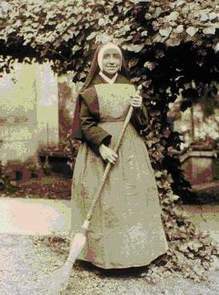 O Jesus, full of Grace and Charity, Victim for sinners, so impelled by Love for us that You willed to die on the cross, I humbly beseech You to glorify in Heaven and on earth The Servant of God and Victim Soul, Sr. Josefa Menendez, who faithfully participated in Your passion and shared Your sufferings, to prepare the way for The Devotion to the Divine Mercy, for the salvation of souls, and for the Glory of Your Heavenly Father. With confidence I beg You to grant me, through her intercession, the Grace of: ………. Make your request here. When you offer up a novena it is usually said for nine days in a row. You can actually say it as many times as you like, there is no law in Heaven that prevents you from doing what the Lord has put in your heart to do.